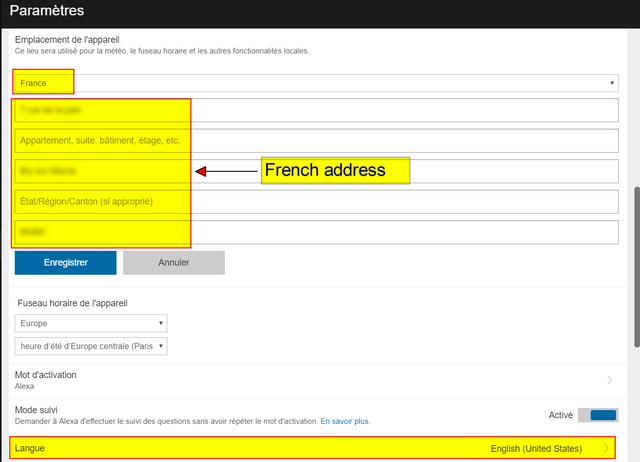 Now it's possible to enter a French address, but you also have to set the language to French, and use French issued skills. You cannot enter English as your language with a French location. Are you talking about a brand new setup ? Because I've had Echos in English with a French address configured and it's been working just fine for months now. I've had the Echo here for about 6 months, but could never enter my French address. It didn't even know my nearest town (Figeac). My address was set as Norwich, and the language was English. Then, if I just said "weather" it gave Norwich conditions. Now that it's possible to enter my actual address, it gives the weather for here, but will not allow me to load any skills on Alexa setup unless the language is set for French. Same for my US-imported Echo Dots.